The term hybrid is derived from Latin hybrida, used for crosses such as of a tame sow and a wild boar. The term came into popular use in English in the 19th century, though examples of its use have been found from the early 17th century. Conspicuous hybrids are popularly named with portmanteau words, starting in the 1920s with the breeding of tiger–lion hybrids (liger and tigon). From the point of view of animal and plant breeders, there are several kinds of hybrid formed from crosses within a species, such as between different breeds. Single cross hybrids result from the cross between two true-breeding organisms which produces an F1 hybrid (first filial generation). The cross between two different homozygous lines produces an F1 hybrid that is heterozygous; having two alleles, one contributed by each parent and typically one is dominant and the other recessive. Typically, the F1 generation is also phenotypically homogeneous, producing offspring that are all similar to each other. Double cross hybrids result from the cross between two different F1 hybrids (i.e., there are four unrelated grandparents). Three-way cross hybrids result from the cross between an F1 hybrid and an inbred line. Triple cross hybrids result from the crossing of two different three-way cross hybrids. Top cross (or "topcross") hybrids result from the crossing of a top quality or pure-bred male and a lower quality female, intended to improve the quality of the offspring, on average. Population hybrids result from the crossing of plants or animals in one population with those of another population. These include interspecific hybrids or crosses between different breeds. 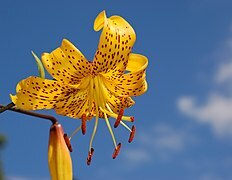 In horticulture, the term stable hybrid is used to describe an annual plant that, if grown and bred in a small monoculture free of external pollen (e.g., an air-filtered greenhouse) produces offspring that are "true to type" with respect to phenotype; i.e., a true-breeding organism. Hybridisation can occur in the hybrid zones where the geographical ranges of species, subspecies, or distinct genetic lineages overlap. For example, the butterfly Limenitis arthemis has two major subspecies in North America, L. a. arthemis (the white admiral) and L. a. astyanax (the red-spotted purple). The white admiral has a bright, white band on its wings, while the red-spotted purple has cooler blue-green shades. Hybridisation occurs between a narrow area across New England, southern Ontario, and the Great Lakes, the "suture region". It is at these regions that the subspecies were formed. Other hybrid zones have formed between described species of plants and animals. From the point of view of genetics, several different kinds of hybrid can be distinguished. A genetic hybrid carries two different alleles of the same gene, where for instance one allele may code for a lighter coat colour than the other. A structural hybrid results from the fusion of gametes that have differing structure in at least one chromosome, as a result of structural abnormalities. A numerical hybrid results from the fusion of gametes having different haploid numbers of chromosomes. A permanent hybrid results when only the heterozygous genotype occurs, as in Oenothera lamarckiana, because all homozygous combinations are lethal. In the early history of genetics, Hugo De Vries supposed these were caused by mutation. From the point of view of taxonomy, hybrids differ according to their parentage. Hybrids between different subspecies (such as between the Bengal tiger and Siberian tiger) are called intra-specific hybrids. Interspecific hybrids are the offspring from interspecies mating; these sometimes result in hybrid speciation. Intergeneric hybrids result from matings between different genera, such as between sheep and goats. Interfamilial hybrids, such as between chickens and guineafowl or pheasants, are reliably described but extremely rare. Interordinal hybrids (between different orders) are few, but have been made with the sea urchin Strongylocentrotus purpuratus (female) and the sand dollar Dendraster excentricus (male). When two distinct types of organisms breed with each other, the resulting hybrids typically have intermediate traits (e.g., one plant parent has red flowers, the other has white, and the hybrid, pink flowers). Commonly, hybrids also combine traits seen only separately in one parent or the other (e.g., a bird hybrid might combine the yellow head of one parent with the orange belly of the other). Interspecific hybrids are bred by mating individuals from two species, normally from within the same genus. The offspring display traits and characteristics of both parents, but are often sterile, preventing gene flow between the species. Sterility is often attributed to the different number of chromosomes between the two species. For example, donkeys have 62 chromosomes, horses have 64 chromosomes, and mules or hinnies have 63 chromosomes. Mules, hinnies, and other normally sterile interspecific hybrids cannot produce viable gametes, because differences in chromosome structure prevent appropriate pairing and segregation during meiosis, meiosis is disrupted, and viable sperm and eggs are not formed. However, fertility in female mules has been reported with a donkey as the father. A variety of mechanisms limit the success of hybridisation, including the large genetic difference between most species. Barriers include morphological differences, differing times of fertility, mating behaviors and cues, and physiological rejection of sperm cells or the developing embryo. Some act before fertilization; others after it. In plants, some barriers to hybridisation include blooming period differences, different pollinator vectors, inhibition of pollen tube growth, somatoplastic sterility, cytoplasmic-genic male sterility and structural differences of the chromosomes. A few animal species are the result of hybridization. The Lonicera fly is a natural hybrid. The American red wolf appears to be a hybrid of the gray wolf and the coyote, although its taxonomic status has been a subject of controversy. The European edible frog is a semi-permanent hybrid between pool frogs and marsh frogs; its population requires the continued presence of at least one of the parent species. Cave paintings indicate that the European bison is a natural hybrid of the aurochs and the steppe bison. Plant Hybridization is more commonplace compared to animal hybridization. Many crop species are hybrids, including notably the polyploid wheats: some have four sets of chromosomes (tetraploid) or six (hexaploid), while other wheat species have (like most eukaryotic organisms) two sets (diploid), so hybridization events likely involved the doubling of chromosome sets, causing immediate genetic isolation. Hybridization may be important in speciation in some plant groups. However, homoploid hybrid speciation (not increasing the number of sets of chromosomes) may be rare: by 1997, only 8 natural examples had been fully described. Experimental studies suggest that hybridization offers a rapid route to speciation, a prediction confirmed by the fact that early generation hybrids and ancient hybrid species have matching genomes, meaning that once hybridization has occurred, the new genome can remain stable. Many hybrid zones are known where the ranges of two species meet, and hybrids are continually produced in great numbers. These hybrid zones are useful as biological model systems for studying the mechanisms of speciation. Recently DNA analysis of a bear shot by a hunter in the North West Territories confirmed the existence of naturally-occurring and fertile grizzly–polar bear hybrids. Hybridization between reproductively isolated species often results in hybrid offspring with lower fitness than either parental. However, hybrids are not, as might be expected, always intermediate between their parents (as if there were blending inheritance), but are sometimes stronger or perform better than either parental lineage or variety, a phenomenon called heterosis, hybrid vigour, or heterozygote advantage. This is most common with plant hybrids. A transgressive phenotype is a phenotype that displays more extreme characteristics than either of the parent lines. Plant breeders use several techniques to produce hybrids, including line breeding and the formation of complex hybrids. An economically important example is hybrid maize (corn), which provides a considerable seed yield advantage over open pollinated varieties. Hybrid seed dominates the commercial maize seed market in the United States, Canada and many other major maize-producing countries. In a hybrid, any trait that falls outside the range of parental variation (and is thus not simply intermediate between its parents) is considered heterotic. Positive heterosis produces more robust hybrids, they might be stronger or bigger; while the term negative heterosis refers to weaker or smaller hybrids. Heterosis is common in both animal and plant hybrids. For example, hybrids between a lion and a tigress ("ligers") are much larger than either of the two progenitors, while "tigons" (lioness × tiger) are smaller. Similarly, the hybrids between the common pheasant (Phasianus colchicus) and domestic fowl (Gallus gallus) are larger than either of their parents, as are those produced between the common pheasant and hen golden pheasant (Chrysolophus pictus). Spurs are absent in hybrids of the former type, although present in both parents. Hybridization is greatly influenced by human impact on the environment, through effects such as habitat fragmentation and species introductions. Such impacts make it difficult to conserve the genetics of populations undergoing introgressive hybridization. Humans have introduced species worldwide to environments for a long time, both intentionally for purposes such as biological control, and unintentionally, as with accidental escapes of individuals. Introductions can drastically affect populations, including through hybridization. There is a kind of continuum with three semi-distinct categories dealing with anthropogenic hybridization: hybridization without introgression, hybridization with widespread introgression (backcrossing with one of the parent species), and hybrid swarms (highly variable populations with much interbreeding as well as backcrossing with the parent species). Depending on where a population falls along this continuum, the management plans for that population will change. Hybridization is currently an area of great discussion within wildlife management and habitat management. Global climate change is creating other changes such as difference in population distributions which are indirect causes for an increase in anthropogenic hybridization. Conservationists disagree on when is the proper time to give up on a population that is becoming a hybrid swarm, or to try and save the still existing pure individuals. Once a population becomes a complete mixture, the goal becomes to conserve those hybrids to avoid their loss. Conservationists treat each case on its merits, depending on detecting hybrids within the population. It is nearly impossible to formulate a uniform hybridization policy, because hybridization can occur beneficially when it occurs "naturally", and when hybrid swarms are the only remaining evidence of prior species, they need to be conserved as well. Regionally developed ecotypes can be threatened with extinction when new alleles or genes are introduced that alter that ecotype. This is sometimes called genetic mixing. Hybridization and introgression, which can happen in natural and hybrid populations, of new genetic material can lead to the replacement of local genotypes if the hybrids are more fit and have breeding advantages over the indigenous ecotype or species. These hybridization events can result from the introduction of non-native genotypes by humans or through habitat modification, bringing previously isolated species into contact. Genetic mixing can be especially detrimental for rare species in isolated habitats, ultimately affecting the population to such a degree that none of the originally genetically distinct population remains. The Green Revolution of the 20th century relied on hybridization to create high-yielding varieties, along with increased reliance on inputs of fertilizers, pesticides, and irrigation. In agriculture and animal husbandry, the Green Revolution's use of conventional hybridization increased yields by breeding "high-yielding varieties". The replacement of locally indigenous breeds, compounded with unintentional cross-pollination and crossbreeding (genetic mixing), has reduced the gene pools of various wild and indigenous breeds resulting in the loss of genetic diversity. Since the indigenous breeds are often well-adapted to local extremes in climate and have immunity to local pathogens, this can be a significant genetic erosion of the gene pool for future breeding. Therefore, commercial plant geneticists strive to breed "widely adapted" cultivars to counteract this tendency. Familiar examples of equid hybrids are the mule, a cross between a female horse and a male donkey, and the hinny, a cross between a female donkey and a male horse. Pairs of complementary types like the mule and hinny are called reciprocal hybrids. Among many other mammal crosses are hybrid camels, crosses between a bactrian camel and a dromedary. The first known instance of hybrid speciation in marine mammals was discovered in 2014. The clymene dolphin (Stenella clymene) is a hybrid of two Atlantic species, the spinner and striped dolphins. Cagebird breeders sometimes breed bird hybrids known as mules between species of finch, such as goldfinch × canary. Among amphibians, Japanese giant salamanders and Chinese giant salamanders have created hybrids that threaten the survival of Japanese giant salamanders because of competition for similar resources in Japan. Among fish, a group of about fifty natural hybrids between Australian blacktip shark and the larger common blacktip shark was found by Australia's eastern coast in 2012. Among insects, so-called killer bees were accidentally created during an attempt to breed a strain of bees that would both produce more honey and be better adapted to tropical conditions. It was done by crossing a European honey bee and an African bee. The Colias eurytheme and C. philodice butterflies have retained enough genetic compatibility to produce viable hybrid offspring. Hybrid speciation may have produced the diverse Heliconius butterflies, but that is disputed. Plant species hybridize more readily than animal species, and the resulting hybrids are fertile more often. Many plant species are the result of hybridization, combined with polyploidy, which duplicates the chromosomes. Chromosome duplication allows orderly meiosis and so viable seed can be produced. Plant hybrids are generally given names that include an "×" (not in italics), such as Platanus × acerifolia for the London plane, a natural hybrid of P. orientalis (oriental plane) and P. occidentalis (American sycamore). The parent's names may be kept in their entirety, as seen in Prunus persica × Prunus americana, with the female parent's name given first, or if not known, the parent's names given alphabetically. Plant species that are genetically compatible may not hybridize in nature for various reasons, including geographical isolation, differences in flowering period, or differences in pollinators. Species that are brought together by humans in gardens may hybridize naturally, or hybridization can be facilitated by human efforts, such as altered flowering period or artificial pollination. Hybrids are sometimes created by humans to produce improved plants that have some of the characteristics of each of the parent species. Much work is now being done with hybrids between crops and their wild relatives to improve disease-resistance or climate resilience for both agricultural and horticultural crops. Some crop plants are hybrids from different genera (intergeneric hybrids), such as Triticale, × Triticosecale, a wheat–rye hybrid. Most modern and ancient wheat breeds are themselves hybrids; bread wheat, Triticum aestivum, is a hexaploid hybrid of three wild grasses. Several commercial fruits including loganberry (Rubus × loganobaccus) and grapefruit (Citrus × paradisi) are hybrids, as are garden herbs such as peppermint (Mentha × piperita), and trees such as the London plane (Platanus × acerifolia). Among many natural plant hybrids is Iris albicans, a sterile hybrid that spreads by rhizome division, and Oenothera lamarckiana, a flower that was the subject of important experiments by Hugo de Vries that produced an understanding of polyploidy. Sterility in a non-polyploid hybrid is often a result of chromosome number; if parents are of differing chromosome pair number, the offspring will have an odd number of chromosomes, which leaves them unable to produce chromosomally-balanced gametes. While that is undesirable in a crop such as wheat, for which growing a crop that produces no seeds would be pointless, it is an attractive attribute in some fruits. Triploid bananas and watermelons are intentionally bred because they produce no seeds and are also parthenocarpic. Oase 2 skull may be a human-Neanderthal hybrid. There is evidence of hybridisation between modern humans and other species of the genus Homo. In 2010, the Neanderthal genome project showed that 1–4% of DNA from all people living today, apart from most Sub-Saharan Africans, is of Neanderthal heritage. Analyzing the genomes of 600 Europeans and East Asians found that combining them covered 20% of the Neanderthal genome that is in the modern human population. Ancient human populations lived and interbred with Neanderthals, Denisovans, and at least one other extinct Homo species. Thus, Neanderthal and Denisovan DNA has been incorporated into human DNA by introgression. In 1998, a complete prehistorical skeleton found in Portugal, the Lapedo child, had features of both anatomically modern humans and Neanderthals. Some ancient human skulls with especially large nasal cavities and unusually shaped braincases represent human-Neanderthal hybrids. A 37,000- to 42,000-year-old human jawbone found in Romania's Oase cave contains traces of Neanderthal ancestry[a] from only four to six generations earlier. All genes from Neanderthals in the current human population are descended from Neanderthal fathers and human mothers. A Neanderthal skull unearthed in Italy in 1957 reveals Neanderthal mitochondrial DNA, which is passed on through only the maternal lineage, but the skull has a chin shape similar to modern humans. It is proposed that it was the offspring of a Neanderthal mother and a human father. 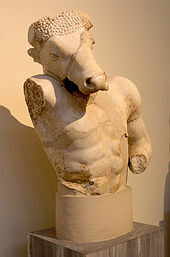 Folk tales and myths sometimes contain mythological hybrids; the Minotaur was the offspring of a human, Pasiphaë, and a white bull. More often, they are composites of the physical attributes of two or more kinds of animals, mythical beasts, and humans, with no suggestion that they are the result of interbreeding, as in the centaur (man/horse), chimera (goat/lion/snake), hippocamp (fish/horse), and sphinx (woman/lion). The Old Testament mentions a first generation of half-human hybrid giants, the Nephilim, while the apocryphal Book of Enoch describes the Nephilim as the wicked sons of fallen angels and attractive women. ^ Signs of Neanderthal lineage include a wide jaw and large teeth that get bigger toward the back of the mouth. ^ Wricke, Gunter; Weber, Eberhard (1986). Quantitative genetics and selection in plant breeding. W. de Gruyter. p. 257. ^ Rawlings, J. O.; Cockerham, C. Clark (June 1962). "Analysis of Double Cross Hybrid Populations". Biometrics. 18 (2): 229–244. doi:10.2307/2527461. JSTOR 2527461. ^ Thompson, K. F. (1964). "Triple-cross hybrid kale". Euphytica. 13: 173. doi:10.1007/BF00033306 (inactive 22 February 2019). ^ Ries, Leslie; Mullen, Sean P. (2008). "A Rare Model Limits the Distribution of Its More Common Mimic: A Twist on Frequency-Dependent Batesian Mimicry". Evolution. 62 (7): 1798–803. doi:10.1111/j.1558-5646.2008.00401.x. PMID 18410533. ^ a b c d e Rieger, R.; Michaelis A.; Green, M. M. (1991). Glossary of Genetics: Classical and Molecular (5th ed.). Springer-Verlag. p. 256. ISBN 978-0-387-52054-4. ^ de Vries, Hugo (January 1919). "Oenothera rubrinervis; A Half Mutant". Botanical Gazette. 67 (1): 1–26. doi:10.1086/332396. JSTOR 2468868. ^ Kelk, Dawn A.; Gartley, Cathy J.; Buckrell, Brian C.; King, W. Allan (1997). "The interbreeding of sheep and goats". Canadian Veterinary Journal. 38 (4): 235–237. PMC 1576582. PMID 9105723. ^ Rong, R.; Chandley, A. C.; Song, J.; McBeath, S.; Tan, P. P.; Bai, Q.; Speed, R. M. (1988). 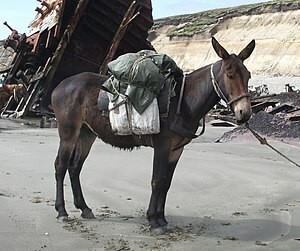 "A fertile mule and hinny in China". Cytogenetics and Cell Genetics. 47 (3): 134–9. doi:10.1159/000132531. PMID 3378453. ^ Baker, H. G. (1959). "Reproductive methods as factors in speciation in flowering plants". Cold Spring Harb Symp Quant Biol. 24: 177–191. doi:10.1101/sqb.1959.024.01.019. PMID 13796002. ^ a b Gornicki, Piotr; et al. (2014). "The chloroplast view of the evolution of polyploid wheat". New Phytologist. 204 (3): 704–714. doi:10.1111/nph.12931. PMID 25059383. ^ Rutledge, Linda Y.; et al. (2012). "Conservation genomics in perspective: A holistic approach to understanding Canis evolution in North America" (PDF). Biological Conservation. 155: 186–192. doi:10.1016/j.biocon.2012.05.017. ^ Chambers, Steven M.; et al. (2012). "An account of the taxonomy of North American wolves from morphological and genetic analyses". North American Fauna. 77: 1–67. doi:10.3996/nafa.77.0001. ^ Frost, Grant; et al. (15 March 2006). "The amphibian tree of life". Bulletin of the American Museum of Natural History (297). ^ Soubrier, Julien; et al. (18 October 2016). "Early cave art and ancient DNA record the origin of European bison". Nature Communications. 7: 13158. doi:10.1038/ncomms13158. PMC 5071849. PMID 27754477. ^ Rieseberg, Loren H. (1997). "Hybrid Origins of Plant Species". Annual Review of Ecology, Evolution, and Systematics. 28: 359–389. CiteSeerX 10.1.1.718.9871. doi:10.1146/annurev.ecolsys.28.1.359. ^ Rieseberg, Loren H.; Margaret A. Archer; Robert K. Wayne (July 1999). "Transgressive segregation, adaptation and speciation". Heredity. 83 (4): 363–372. doi:10.1038/sj.hdy.6886170. PMID 10583537. ^ a b c Allendorf, Fred W.; Leary, R. F.; Spruell, P.; Wenburg, J. K. (2001). "The problems with hybrids: setting conservation guidelines". Trends in Ecology & Evolution. 16 (11): 613–622. doi:10.1016/S0169-5347(01)02290-X. ^ Ehrlich, Paul; John Holdren (26 March 1971). "Impact of population Growth". Science. 171 (3977): 1212–1216. doi:10.1126/science.171.3977.1212. ^ Mooney, H. A.; Cleland, E. E. (2001). "The evolutionary impact of invasive species". PNAS. 98 (10): 5446–5451. doi:10.1073/pnas.091093398. PMC 33232. PMID 11344292. ^ Rhymer, J. M.; Simberloff, D. (1996). "Extinction by Hybridization and Introgression". Annual Review of Ecology and Systematics. 27: 83–109. doi:10.1146/annurev.ecolsys.27.1.83. ^ Farmer, B. H. (1986). "Perspectives on the 'Green Revolution' in South Asia". Modern Asian Studies. 20 (1): 175–199. doi:10.1017/s0026749x00013627. ^ Bhanoo, Sindya (13 January 2014). "Scientists Find Rare Hybrid of Two Other Dolphin Species". The New York Times. Retrieved 20 January 2014. ^ Grula, John W.; Taylor, Orley R. (1980). "The Effect of X-Chromosome Inheritance on Mate-Selection Behavior in the Sulfur Butterflies, Colias eurytheme and C. Philodice". Evolution. 34 (4): 688–95. doi:10.2307/2408022. JSTOR 2408022. ^ Mallet, J.; Beltrán, M.; Neukirchen, W.; Linares, M. (2007). "Natural hybridization in heliconiine butterflies: The species boundary as a continuum". BMC Evolutionary Biology. 7: 28. doi:10.1186/1471-2148-7-28. PMC 1821009. PMID 17319954. ^ Brower, A.V.Z. (2011). "Hybrid speciation in Heliconius butterflies? A review and critique of the evidence". Genetica. 139 (2): 589–609. doi:10.1007/s10709-010-9530-4. PMC 3089819. PMID 21113790. ^ Goulet, Benjamin E.; Roda, Federico; Hopkins, Robin (2016). "Hybridization in Plants: Old Ideas, New Techniques". Plant Physiology. 173 (1): 65–78. doi:10.1104/pp.16.01340. PMC 5210733. PMID 27895205. ^ Warschefsky, E.; Penmetsa, R. V.; Cook, D. R.; von Wettberg, E. J. B. (8 October 2014). "Back to the wilds: Tapping evolutionary adaptations for resilient crops through systematic hybridization with crop wild relatives". American Journal of Botany. 101 (10): 1791–1800. doi:10.3732/ajb.1400116. PMID 25326621. ^ Stace, C. A. (1987). "Triticale: A Case of Nomenclatural Mistreatment". Taxon. 36 (2): 445–452. doi:10.2307/1221447. JSTOR 1221447. ^ Darrow, G.M. (1955). "Blackberry—raspberry hybrids". Journal of Heredity. 46 (2): 67–71. doi:10.1093/oxfordjournals.jhered.a106521. ^ Vernot, B.; Akey, J. M. (2014). "Resurrecting Surviving Neandertal Lineages from Modern Human Genomes". Science. 343 (6174): 1017–1021. doi:10.1126/science.1245938. PMID 24476670. ^ Green, R.E. ; Krause, J.; Briggs, A.W. ; Maricic, T.; Stenzel, U.; Kircher, M.; et al. (2010). "A Draft Sequence of the Neandertal Genome". Science. 328 (5979): 710–722. doi:10.1126/science.1188021. PMC 5100745. PMID 20448178. ^ Huerta-Sánchez, Emilia; Jin, Xin; Asan; Bianba, Zhuoma; Peter, Benjamin M.; Vinckenbosch, Nicolas; Liang, Yu; Yi, Xin; He, Mingze; Somel, Mehmet; Ni, Peixiang; Wang, Bo; Ou, Xiaohua; Huasang; Luosang, Jiangbai; Cuo, Zha XiPing; Li, Kui; Gao, Guoyi; Yin, Ye; Wang, Wei; Zhang, Xiuqing; Xu, Xun; Yang, Huanming; Li, Yingrui; Wang, Jian; Wang, Jun; Nielsen, Rasmus (2014). "Altitude adaptation in Tibetans caused by introgression of Denisovan-like DNA". Nature. 512 (7513): 194–197. doi:10.1038/nature13408. PMC 4134395. PMID 25043035. ^ Duarte, Cidalia; et al. (22 June 1999). "The early Upper Paleolithic human skeleton from the Abrigo do Lagar Velho (Portugal) and modern human emergence in Iberia". PNAS. 96 (13): 7604–7609. doi:10.1073/pnas.96.13.7604. PMC 22133. PMID 10377462. ^ Fu, Qiaomei; et al. (13 August 2015). "An early modern human from Romania with a recent Neanderthal ancestor". Nature. 524 (7564): 216–219. doi:10.1038/nature14558. PMC 4537386. PMID 26098372. ^ Wang, C.C. ; Farina, S.E. ; Li, H. (2013) [Online 2012]. "Neanderthal DNA and modern human origins". Quaternary International. 295: 126–129. doi:10.1016/j.quaint.2012.02.027. ^ Condeme, Silvana; et al. (27 March 2013). "Possible Interbreeding in Late Italian Neanderthals? New Data from the Mezzena Jaw (Monti Lessini, Verona, Italy)". PLoS ONE. 9 (1): e59781. doi:10.1371/journal.pone.0059781. PMC 3609795. PMID 23544098.